The Beaverton Library Foundation recently awarded its first scholarship to Kelsey Martin. 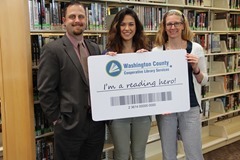 She was selected from an impressive group of recent high school graduates who had all volunteered at the library for at least 50 hours. Kelsey is a graduate of Beaverton High School and will be studying at Occidental College in Los Angeles this fall to major in cognitive science/psychology. She is the daughter of Craig and Sheila Martin. In addition to her volunteer work at the library, Kelsey was president of her high school French Club, the treasurer of the Key Club, and a National Honor Society scholar. She recently received an award from the American Psychological Association for her original research on stereotypes. Kelsey says that volunteering at the library taught her the importance of time management, as she worked on several library tasks including shelving items on hold, helping with summer reading, and preparing materials for children’s programs. PreviousCover Story: Beaverton City Library!